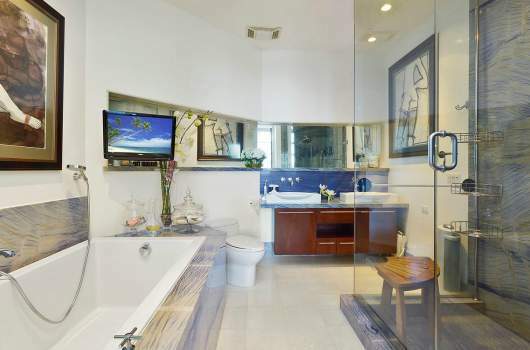 If closet is the operative word when describing your water closet, you will definitely be jealous of these cavernous bathrooms. 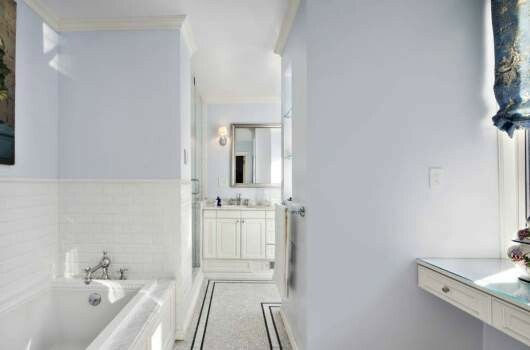 Soaring ceilings with skylights, soaking tubs the size of Olympic pools and showers big enough for the entire varsity team: here's a sample of lavish lavatories in NYC. This $20 million TriBeCa townhouse has a long bathroom with herringbone floors and a wall of windows. 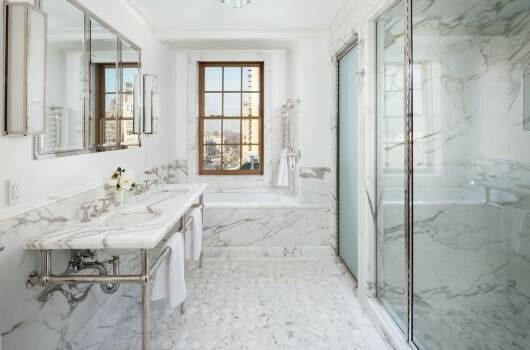 The bathroom in this $12.5 million Upper West Side penthouse is big enough for the whole family to get ready at the same time, with every function--shower, tub, toilet and two sinks--separate. The freestanding soaking tub (click the image to expand) in this $32 million SoHo penthouse looks more like an art installation than a bathtub. 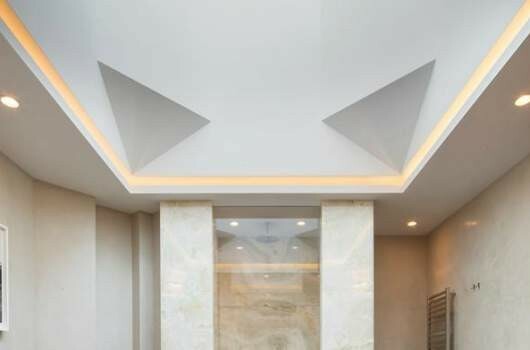 Positioned under a skylight with 20-foot ceilings, this bathroom is positively droolworthy. 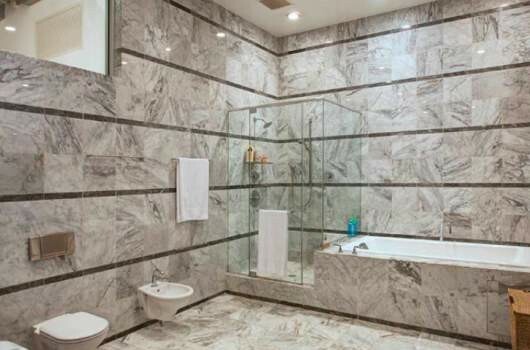 This $15.8 million Upper East Side townhouse has two back-to-back sinks and an enormous shower for romantic (or just rushed) mornings. 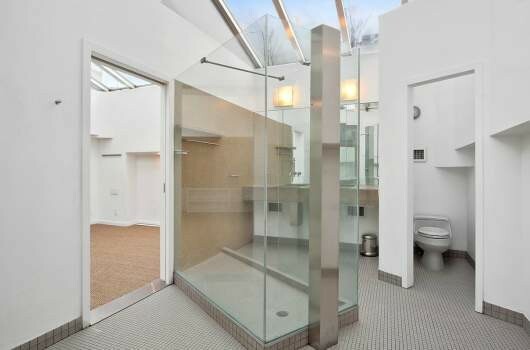 The shower in the bathroom of this $6.3 million SoHo penthouse has three glass walls and a skylight above: the fun of an outdoor shower without leaving the house. 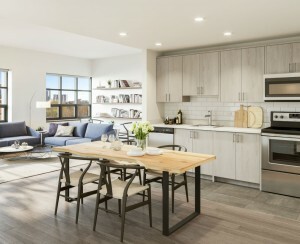 The oversized bathroom in this $6.5 million condo in Williamsburg, Brooklyn has a space for a shower, soaking tub, double sink, toilet and a flatscreen TV. 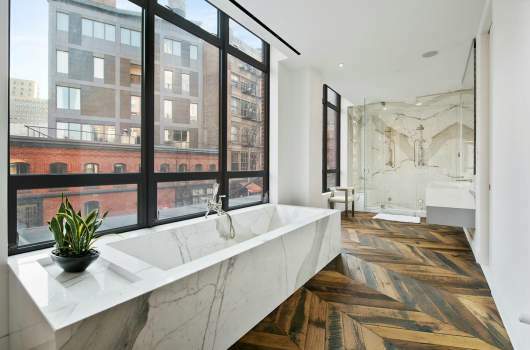 This $4.9 million SoHo loft's bathroom has a bidet! 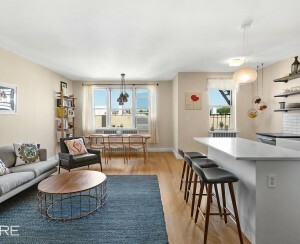 And enough floor space to put on your own Broadway musical. 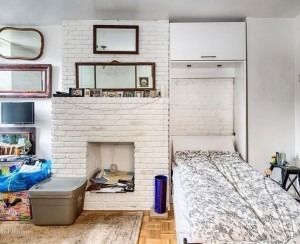 This $5K per month Bushwick, Brooklyn townhouse has a large soaking tub and double sink in the bathroom. 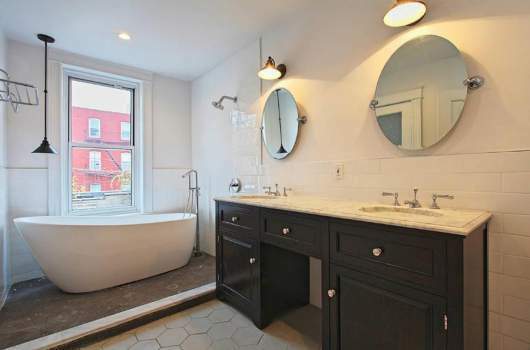 The bathroom in this $2.4 million Beekman co-op looks even bigger because of the hallway, multiple windows and far flung sink. Dreamy. 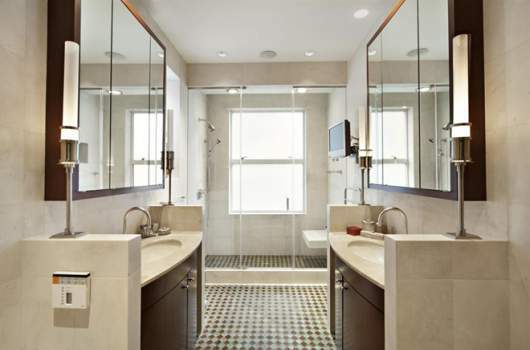 This $14.9 million SoHo co-op has a marble bathroom with a mosaic archway above the tub and a generous shower. Classy. This $27 million Park Avenue condo has a freestanding soaking tub in the center of the large bathroom and an enormous double shower. 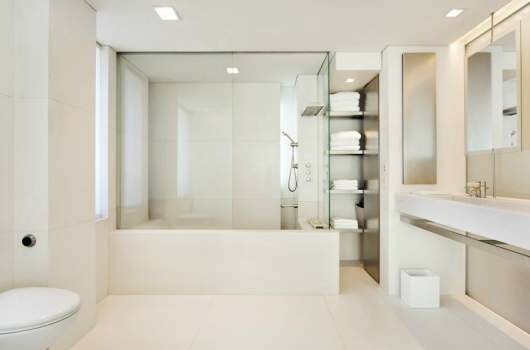 The bathroom in this $18.5 million Upper East Side co-op is impressive for its generous size but also for the clean and simple design—which makes it look even bigger. This $25.7 million Upper East Side duplex has a white marble oversized bathroom with double sinks, a steam room and separate shower.